Lateral view of calyx of Saccocoma tenella from Brodacki (2006) showing the emergence angle of the arms. Living crinoids can be divided morphologically between the stalked sea lilies and the stemless feather stars but, as described in an earlier post, the feather stars are not really entirely stemless. Rather, the column has been reduced to a single plate that still functions as the point of attachment for the cirri, the small tentacle-like appendages that the feather star uses to hang onto the substrate or move about. There were two groups of Mesozoic crinoids that went a step further, completely losing both column and cirri. The Uintacrinida (of the late Cretaceous) and the Roveacrinida (throughout the Mesozoic) were both subgroups of the Articulata, the clade that includes all living crinoids, but they are very distinct from each other and probably lost their stalks independently. Milsom et al. (1994) placed the Uintacrinida as a derived subgroup of the feather stars while the relationships of the Roveacrinida remain mysterious. Because of the lack of any means of attachment to the substrate, both have been regarded as pelagic; as I'll explain below, this seems likely for the roveacrinidans but not for the uintacrinidans. 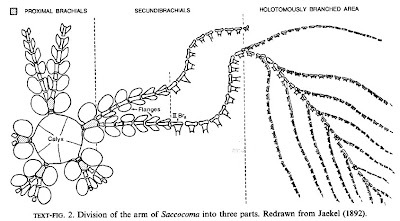 Ventral reconstruction of Saccocoma from Milsom (1994) showing the arrangement of lateral plates in the proximal part and long branches in the distal part of the arms. The roveacrinidans were absolutely tiny animals with the central cup only a couple of millimetres across and the total armspan up to a few centimetres. In the best-known example, Saccocoma, broad wing-like plates were attached to either side of the proximal part of the slender multi-branched arms while the skeleton as a whole was very thin and light. In an influential interpretation of Saccocoma, Otto Jaekel referred to the lateral plates on the arms as "Schwimmplatten" and suggested that they were used to propel the animal through the water. 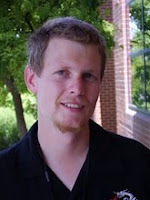 However, Brodacki (2006) pointed out that the mobility of the proximal part of the arms would not have been sufficient for the plates to be used in swimming. Instead, the distal branched parts of the arms would have provided the swimming force while the Schwimmplatten would have provided extra friction to reduce the rate of sinking. Because roveacrinidans would have been heavier than the surrounding water even with their lightened plates, they must have been active (and fairly continuous) swimmers rather than passive floaters. Swimming was probably done by slowly coiling the distal part of the arms inwards then rapidly straightening them outwards so the animal flicked itself through the water. An alternative suggestion (Milsom, 1994) that Saccocoma was benthic on soft mud with the "Schwimmplatten" protecting the animal from being buried is contradicted by the fact that the arms would have emerged from the top of the theca at an angle of 45° rather than being flat. Also, Saccocoma plates are commonly found in coprolites whose mode of deposition indicates that they were produced by pelagic animals (Hess, 1999a). 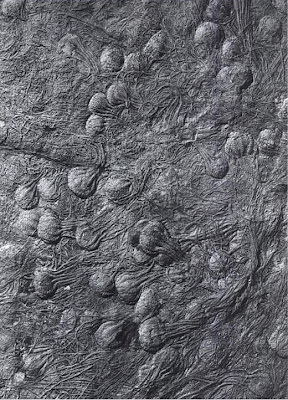 Fossil assemblage of the very aptly named Uintacrinus socialis, from Hess 1999b. In contrast to the minute, light roveacrinidans, the two uintacrinidan genera Uintacrinus and Marsupites were very large crinoids with sack-like, flexible thecas up to 75 mm in diameter and arms up to a metre or more in length. Unlike roveacrinidans, uintacrinidan plates are not reduced but remain robust and heavy. The proximal parts of the arms were integrated into the theca which would have limited their ability to spread outwards as in Saccocoma. Orientation of preserved specimens (and Uintacrinus can sometimes be preserved in extraordinarily dense concentrations) indicates that the habitual life position of uintacrinidans was with the mouth upwards, contradicting suggestions that the theca could have contained some sort of buoyancy organ. Despite the lack of any means of attachment, without any clear adaptations for increasing buoyancy it seems that uintacrinidans would have been benthic rather than pelagic. 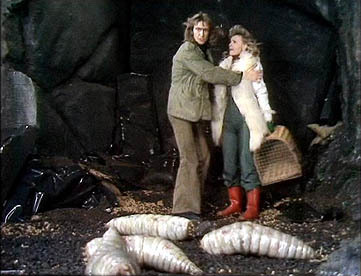 They would have lived in soft mud with the theca buried (hence the lack of attachment structures) and the arms extending upwards from the substrate to collect food particles. Hess (1999b) compares the possible life appearance of Uintacrinus assemblages to "dense patches of tall eel grass". Brodacki, M. 2006. 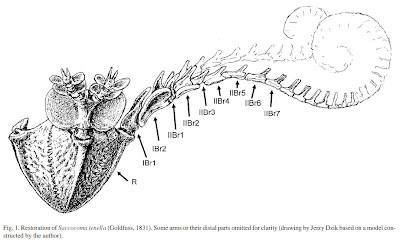 Functional anatomy and mode of life of the latest Jurassic crinoid Saccocoma. Acta Palaeontologica Polonica 51 (2): 261–270. Hess, H. 1999a. Upper Jurassic Solnhofen Plattenkalk of Bavaria, Germany. In Fossil Crinoids (H. Hess, C. E. Brett, W. I. Ausich & M. J. Simms, eds) pp. 216-224. Cambridge University Press. Hess, H. 1999b. Uintacrinus beds of the Upper Cretaceous Niobrara Formation, Kansas, USA. In Fossil Crinoids (H. Hess, C. E. Brett, W. I. Ausich & M. J. Simms, eds) pp. 225-232. Cambridge University Press. Milsom, C. V. 1994. Saccocoma: a benthic crinoid from the Jurassic Solnhofen Limestone, Germany. Palaeontology 37 (1): 121-129. Milsom, C. V., M. J. Simms & A. S. Gale. 1994. Phylogeny and palaeobiology of Marsupites and Uintacrinus. Palaeontology 37 (3): 595-607.
excuse my ignorance... is the last one a real fossil or somebody have done it? The Uintacrinus cluster is a real fossil. Impressive, isn't it?